Cook -Schets van de Marquis de Mendoca Eilanden. Cook, J. - Schets van de Marquis de Mendoca Eilanden. Schets van de Marquis de Mendoca Eilanden. - Cook, J. Title : Schets van de Marquis de Mendoca Eilanden.. Size : 6.9 x 5.9 inches. / 17.5 x 15.0 cm. Description :Captain James Cook (1728-79), explorer, circumnavigator and hydrographer. Three voyages, 1768-71, 1772-75 and 1776-79. 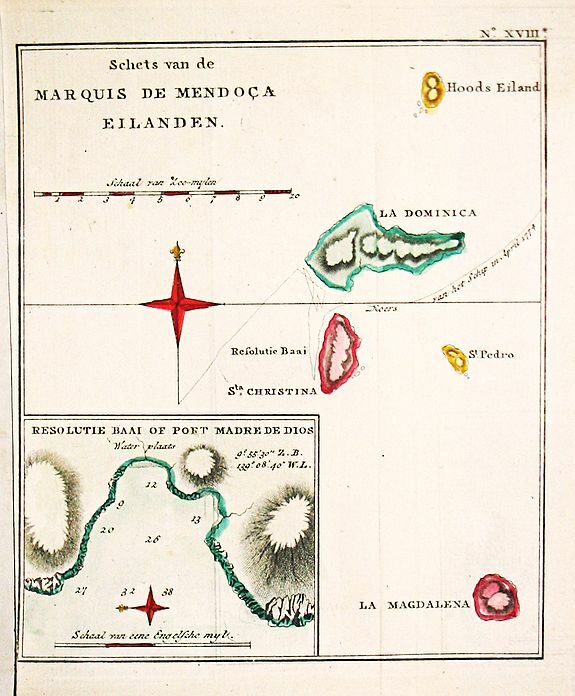 From 1778 on printed editions of ' Captain Cook's Travels' appeared in English, Italian, French and Dutch.A map of the Mendoca Islands, with an inset showing Resolution Bay or Port Madre de Dios. From a Dutch edition of 'Cook's voyages'. Condition : left margin trimmed close, otherwise in very good condtion.